China’s Dynasty Fine Wines is selling off vast quantities of its Bordeaux wine stocks worth millions of yuan, including d’Yquem, Margaux and Angélus to liquidate money to pay company debts and employees, the latest sign of this state-backed wine merchant’s fraught fate after reports of financial losses and fraud investigation, according to Chinese language media Wine Distributor Insider Report. Dynasty, a joint venture between Tianjin government and French company Remy Cointeau, has, in recent years, been mired in bad debts, financial losses and allegations of selling fake wines. A listed company in Hong Kong, Dynasty’s trading has been suspended since March 2013 amid allegations of faking invoices and selling out of condition wines, writes South China Morning Post. Up until now, trading is still suspended until further notice, according to a company announcement posted on its website. The massive Bordeaux wine sale, is estimated to worth millions of yuan, and includes wines from Château Beychevelle, Château d’Yquem, Château Angelus, Château Marguax, Château Ducru-Beaucaillou, Château Talbot and Château Lascombes, according to a wine list obtained by Wine Distributor Insider Report (葡萄酒经销商内参)，a multimedia news org backed by China’s famous financial news writer Wu Xiaobo. “The total value of all the grand cru classé château wines are worth millions of yuan, and Dynasty still has stocks in a bonded warehouse that worth more than this. Underselling these wines, on one hand, is to pay off debts, on the other hand, is to pay company employees’ salaries,” a source who requested anonymity told the news outlet. 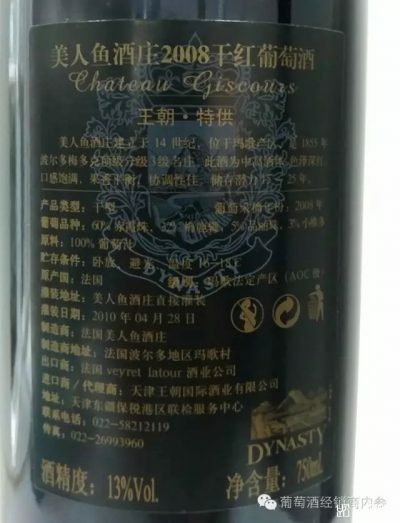 These were part of the wines bought by Dynasty a few years back for nearly RMB 200 million (about US$29 million), but the market has been slow and “Dynasty ran into a series of internal problems”, the source continued, adding that the wines are all stored in good conditions. One batch of a few hundreds of bottles was snapped up by an undisclosed e-commerce company, a merchant told the trade news organisation. Dynasty could sell the remaining wines stored in its bonded warehouse, but could face a significant amount of taxes, a problem for a cash-strapped company, the source said. The company makes its own wines and imports a range of foreign wines to China market as well.